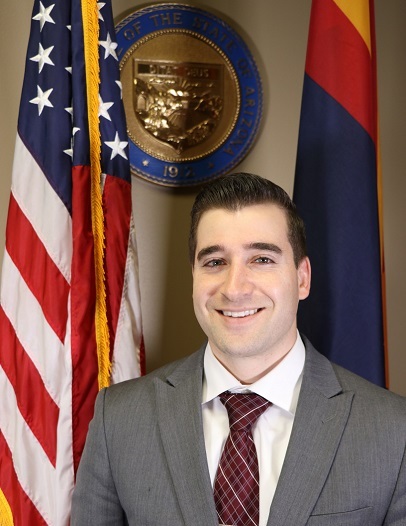 PHOENIX, Ariz., (November 19, 2018)-The Arizona Registrar of Contractors (AZ ROC) is excited to announce Joseph Citelli as the new Chief Counsel and Chief of Legal and Recovery Fund Departments beginning Monday, November 19, 2018. On March 21, 2016, Citelli started working at the AZ ROC as a Staff Attorney. In August 2016, Citelli was appointed the agency’s official Public Records Officer. Citelli also serves as the Vice President of the Arizona Chapter of the Association for Records and information Managers and as a Young Lawyers Division Representative to the State Bar of Arizona Construction Law Section. Citelli graduated from the University of California in Davis with a Bachelor of Arts in Political Science and Communications in 2010. He received his Juris Doctor from the Sandra Day O’Connor College of Law at Arizona State University in 2015. While in law school, Citelli served as Editor in Chief of the Sports and Entertainment Journal. Citelli was also a member of the Corporate and Business Law Society and received recognition as a Willard H. Pedrick Scholar. Before coming to the AZ ROC, Citelli worked as a law clerk for Napier, Coury and Baillie, P. C. Law focusing on administrative, employment, and personal injury law. He also clerked as a judicial extern for the Honorable Judge Daniel P. Collins in the United States Bankruptcy Court, District of Arizona. In mid-October, Nicole Sornsin, AZ ROC’s former Chief Counsel, accepted the position to become the Chief Counsel of the Arizona Department of Administration. Under her leadership, the AZ ROC legal and recovery fund team significantly contributed to the streamlining of the agency’s complaint and licensing processes and the successful deployment of the Arizona State Management System. The Registrar looks forward to continuing the advancements in the legal and recovery fund departments under Citelli’s watch.